As I write this around 11am EST both NFLX and CELG are threatening to close up > 50% from their December 24th closing price, just 14 trading days ago. While that sometimes happens with speculative smallcap stocks, it is very unusual to see a largecap S&P 100 stock accomplish such strong gains in such a short period of time. In fact, the last instance of a 50% close to close gain within 15 days for an S&P 100 stock occurred in 2009. 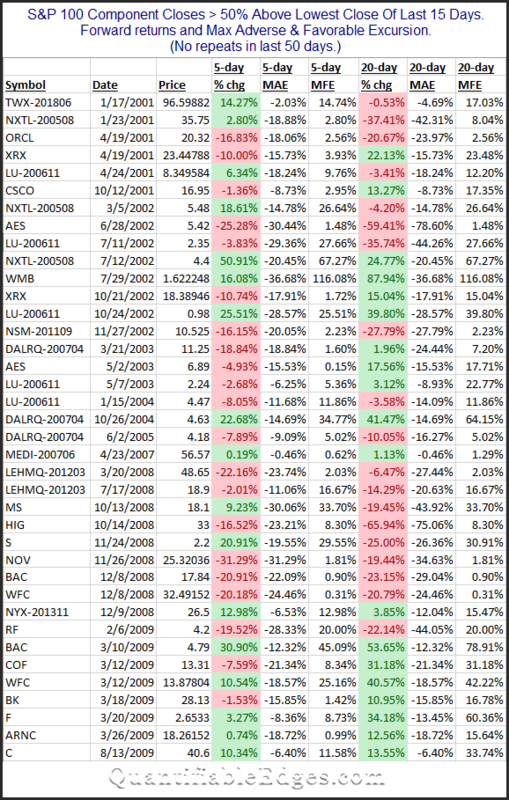 I looked back at other times since 2000 where it has occurred among S&P 100 components, and found only 38 occurrences. Below is the complete list. • It almost never happens except during extreme market conditions, and often during, or just after, a bear market. • The common themes were Financials in 2008-09 and Tech in 2001-02, which were the hardest hit and most volatile groups of their time. • Returns going forward appear bunched and inconsistent. To further illustrate the last point, below are the summary forward returns for all 38 instances. I don’t see a strong and consistent edge among suggested. I do find it interesting that we have two stocks threatening to accomplish the rare feat today. Want research like this delivered directly to your inbox on a timely basis? Sign up for the Quantifiable Edges Email List.